This Amish Clearspring Panel Morris Chair is gorgeously styled with solid hardwood panels and gently sloping arms. 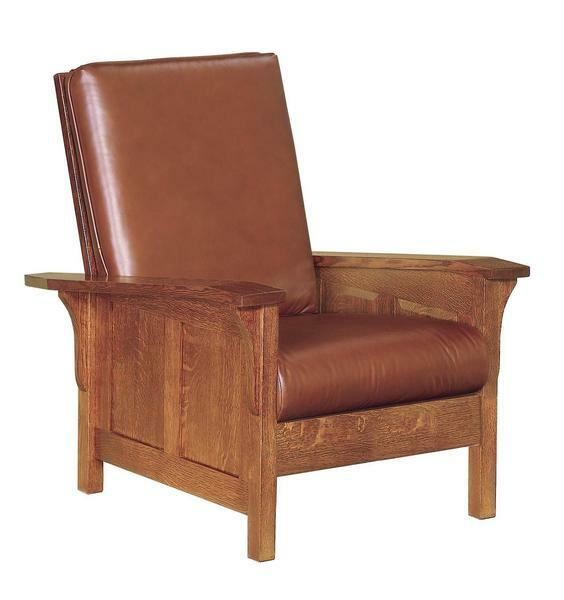 Mortise and Tenon construction as well as other Old World Craftsmanship are standard with this Mission Morris Chair. The recline on this chair is styled after the traditional antique Mission Morris Chairs with the three peg reclining adjustment. Order this lounge chair in the most popular option of quarter sawn white oak wood with a Michael's cherry finish and leather cushions. Pair this with the matching Amish Clearspring Panel Morris Footstool for ultimate comfort and style.